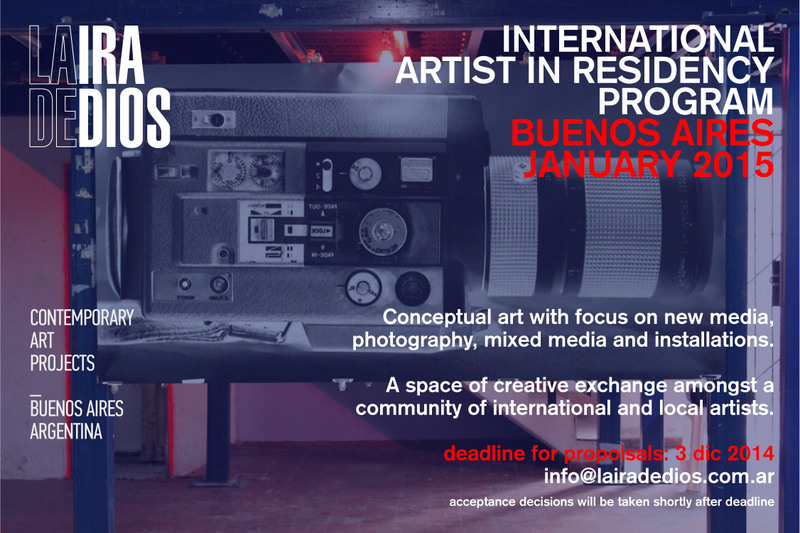 Mission: La Ira de Dios (LID), an artist-run space based in the center of Buenos Aires, Argentina, is hosting an interdisciplinary artists in residence program in January, 2015. The focus of this residency is visual art with a focus on new media, photography, mixed media and installations. The program is structured to create a space of creative exchange amongst a community of international and local artists. LID is located in the Villa Crespo neighborhood at the heart of Argentina’s dynamic contemporary art scene. Bordered by the Palermo neighborhood, Villa Crespo is the nexus of Buenos Aires art activity, situating LID in the midst of a high concentration of galleries and artists studios. The original LID gallery is located in a landmark building for the arts in Buenos Aires that began as a collective effort in 2007 to create a space for galleries and professional artists. In order to expand on our initiative to be a site for dynamic exchange, artistic practice and innovations in media, LID opened a 500 square meter warehouse with new studios and exhibition spaces two blocks away from our formal gallery space. Through lectures, workshops, performances, and our residency programs, LID continues to emerge as one of the leading spaces in Latin America for the diffusion and production of contemporary photography, installations and new media. The studios in our warehouse host temporary and visiting artists, fostering a vibrant and collaborative community of artists. Demographic/Medium: This residency is open to emerging and established artists from a range of disciplines. However, spaces are limited as the selection process will be competitive in order to ensure quality, innovation and a strong commitment to the practical and creative objectives of this residency. The focus of this residency is new media, photography, mixed media and installations. Benefits: This four week intensive residency will accept a select group of artists who will partake in weekly workshops as they immerse themselves in new or ongoing projects. The underlying objective tying together the artists we seek to engage is a motivation to explore the limits of contemporary format, research, process and material. The residency will culminate in a group exhibition in LID’s warehouse where our studios and new exhibition space are located. The clinics will be taught by photographer and University of Buenos Aires Professor of Audiovisual Design, Gabriel Valansi (www.gabrielvalansi.com) and curator Laeticia Mello (www.laeticiamello.com). Mello is a Professor of Art History at the Friends Association of the National Museum of Fine Arts and recently organized an exhibition at the prestigious Fundación Proa. There will be additional seminars and artist talks lead by our project directors, Carolina Magnin (www.carolinamagnin.com/personal) and Pablo Caligaris. Collectors and curators will be in attendance at the final exhibition, creating a platform for the selected artists to sell the work they produce and to potentially establish professional opportunities that can extend beyond their residency at LID. In addition to the group exhibition, the work generated during the residency will be disseminated throughout LID’s online presence and featured in an online catalogue created specifically for the program. The residency aims to stimulate cross cultural discourse that will creatively invigorate both LID as an art space and the group of artists chosen to partake in the program. Posted in Argentina, La Ira de DiosTagged Argentina, art residency, Artist, Artist Residency, artist-run space, artists, Audiovisual Design, Buenos Aires, Carolina Magnin, collectors, conceptual art, contemporary, Contemporary Art, Contemporary Art Projects, curators, exhibition spaces, Friends Association of the National Museum of Fine Arts, Gabriel Valansi, group exhibition, installations, interdisciplinary, International, La Ira de Dios, Laeticia Mello, Latin America, lectures, local, mixed media, New Media, new studios, no application fee, Pablo Caligaris, Palermo, performances, Photography, residence, residency, Residency Program, Studios, University of Buenos Aires, Villa Crespo, visiting artists, warehouse, workshopsBookmark the permalink.